Posts categorized "Flash the Donkey"
On Friday I posted a photo of my little office- the room I'm spending most of my life in right now. You see, I'm working on another book! Yep, it's true. What is this book about, you ask? Well, it's a book about finding new purpose as you work through the uncertainties of transitioning from one season of life into another (remember I've gone from being a busy mom to an empty-nester). It's about experiencing the pain of failure and disappointment, and discovering that these things make a way for a deeper, more joyful spiritual life. It's got donkeys, and funny stories, and some deeply personal things that I've never shared before. I've cried my eyes out, and laughed myself silly....and I've also done plenty of beating my head against the keyboard trying to get this book written. Just for fun, here is a photo of my "idea" wall - color-coded post-it notes with words or phrases to jog my memory or keep me focused. I find that I need a big visual board to help me see the direction I'm supposed to go. Did I mention the book has donkeys? Well of course there is Flash, and his little friend Henry. They are my walking companions and sounding boards. Without them, I wouldn't have a story to tell. These guys make me laugh, and they make me ponder some of the big questions in life. 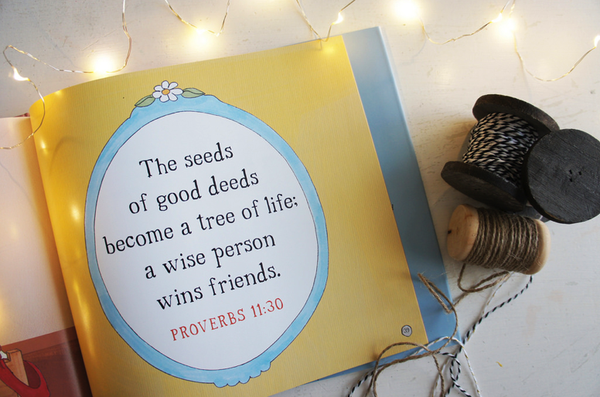 They help me remember Bible stories and prayer and all kinds of good stuff. I will be writing all summer long, so if I have a far-away look in my eyes or you don't hear from me for days on end, you now know the reason why. If you feel so inclined to pray for me, I would really love that. I so want to tell a good story, one that will capture my readers and inspire them to see their own circumstances in a new light, and I need God's help to do it. Thank you to all of you dear people who keep buying and sharing my first book. You inspire me with your comments, emails and Amazon reviews! I'm thinking of you every single day as I write. 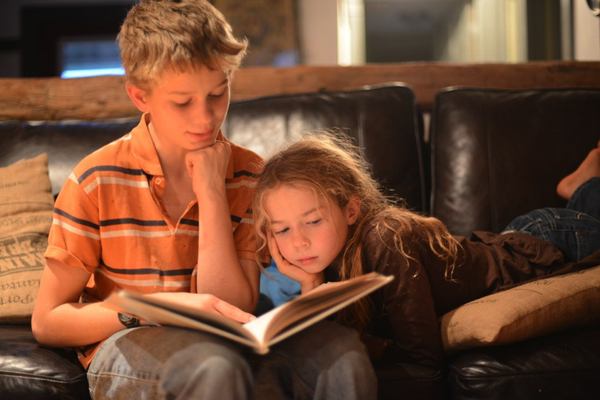 Books to Give + A Gift for YOU! I've got a gift for you, and a sweet way to finish up your Christmas shopping! Read on! Most of you know about my new children's book, Flash the Donkey Makes New Friends, which came out recently. I'm so excited that it is finding its way under Christmas trees and into the hands of little people everywhere! It's a story of an adorable donkey, whose curiosity sometimes gets him into trouble. With the help of his newfound friends – Jed the goat, Carson the pig, and Ruby the chicken – Flash manages to turn problems into adventures and learns valuable lessons along the way. It's really a story about kindness, something this world needs more than ever right about now. I loved getting to write and illustrate a story that invites conversation and activities for you and your children (or grandchildren!) People are falling in love with Flash and his friends, and are treasuring the charming story in these pages. Of course, the inspiration for the children's book was the Real Life Flash, who was featured in my personal memoir, Flash the Homeless Donkey Who Taught Me About Life, Faith and Second Chances. Named a 2015 Best Summer Book by Publishers Weekly, Flash remains a top book to read and share with others. It's both funny and touching, and I am bowled over that people love it so much they buy copies to give away! It is now in paperback, which makes it even better. Purchase a total of five books (any combination of the memoir and/or children's books) and receive a copy of Made to Belong - A Six Week Journey to Discover Your Life's Purpose as my gift to you! This book provides a simple daily devotional, plus prompts and questions that are perfect for personal or group study. It is a brand new book, which I wrote as a resource for The Belong Tour, and its message is near and dear to my heart. As a "late-bloomer" to discovering my own purpose, I know you'll enjoy walking with me through the pages of Habakkuk as our inspiration for this workbook. There are two ways to take advantage of this! 1. You can order directly from my store to receive signed copies. These are a little more expensive, but they are personalized by both Flash and I! I have a very limited quantity, so it will be first come-first served. If you'd like your books personalized, this is for you... but you'll have to hurry. 2. If you prefer Amazon, you can order there. After you order, email a copy of your receipt (a screenshot will work), along with your address, and I'll put Made to Belong in the mail to you, as my gift. Send it to rachelanne@homesanctuary.com. This way is super easy and quick, and a bit less expensive. Remember, just order any total of five books to receive Made to Belong as a gift. I hope you'll keep a copy of each to keep for yourself! I so appreciate each of you reading my blog and books throughout the year. I'm looking forward to 2017 and sharing my heart especially for us "older moms" and women in transitional seasons of life. We need encouragement, and I'm here to remind you that you are loved and you are important to God. You are a blessing to me, and I am grateful! You're Invited to a Pajama Party! I would love for you to come to my PJ Party on Friday night (Oct. 7) at 7 pm! Now, not everyone will fit into my living room, so this will be a VIRTUAL party, via Facebook Live! All you need to do is hop over to Flash the Donkey's Facebook page, and I'll be posting live video so you can join in! There will be music, games, food, and a special book reading...and of course Real Life Flash will be there too. So, gather your kids, grandkids, nieces, nephews, and any other kids in your life, and let's have some fun together! The winner in yesterday's drawing for Flash the Donkey Makes New Friends is Robin Brantley. Robin, send me your address via email and I'll get a book to you asap! Watch out world, here's Jed! Jed....well you could say he wears his heart on his sleeve. You never have to guess what he is feeling because it's written all over his face. When Jed is excited, he leaps on top of tables. When he is mad, he harrumphs up a pile of hay bales. When he's annoyed, he crosses his arms and looks away. When he's happy, he grabs a ukelele and belts out a tune. Jed is the goat who shoots from the hip, speaks his mind, jumps to conclusions, and commands the room. He's just like that "annoying little brother" that reeeally drives you crazy sometimes. But you can't live without him because, after all, he's the one that brings the party with him wherever he goes. Today, we celebrate the "Jeds" we know and love. Who is it that makes you laugh, drives you nuts sometimes, and lives life to the hilt? Please share your own special "Jed" story today for another chance at a signed book! Jane, honey...send me your address and I'll get your book to you! You know how awesome it is when you get to introduce people to each other that you just know will be instant friends? That's how I feel about my friend, Ruby–and you. See, when I wrote Flash the Donkey Makes New Friends, I knew that Ruby had to be a central character. A mis-matched collection of companions MUST have someone who's in charge! Everyone should have a chicken for a friend, right? A mother-hen type who seems to know just what to do in any situation. Ruby will direct you to a chair so you can sit down. She will produce a bandage and ice, almost out of thin air. Ruby happens to have a pot of soup on the stove. There, there. Ruby knows just how to cheer you up. Well, that ruffles her feathers just thinking about it. Ruby fusses. She clucks. She talks to herself as she bustles about. And always stylish, she is never without her earrings and necklace. You can be assured that Ruby is a fine feathered friend, who will forever believe in you, worry over you, and make sure you've eaten a good breakfast. She's always got your back. See, I knew you'd love her! Since I'm counting down the days until you meet Ruby in real life, (when my book releases on Oct. 1,) I'd like to do a little PRE-CELEBRATING! One lucky commenter will receive a signed copy of Flash the Donkey Makes New Friends today. Simply let us know: who is a "Ruby" in your life? Do you have someone who fusses, clucks and bustles about your life, making sure she knows all the details? My friends, I'm so excited I'm about to bust. My brand new book, written especially for children and starring my dear friend Flash, will be out on October 1! "A Stray donkey with a penchant for inventions is taken in by a mismatched collection of barnyard friends. Flash the Donkey Makes New Friends is the heartwarming story of a not-so ordinary donkey who needs a special place to belong. Flash is the inquisitive type who loves to invent things and solve problems, but his curiosity sometimes gets him into trouble! With the help of his new-found friends–Jed the goat, Carson the pig, and Ruby the chicken–Flash manages to turn problems into adventures and learns valuable lessons along the way. 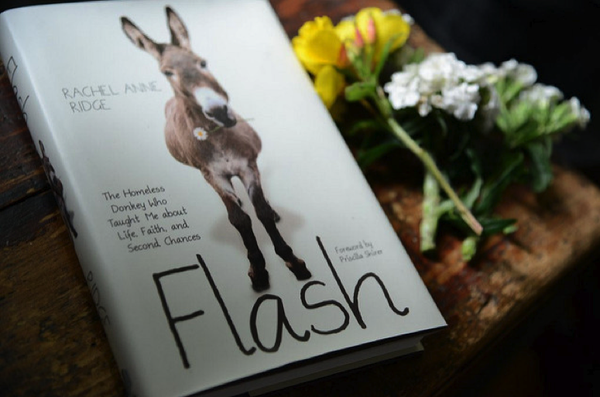 Inspired by Rachel Anne Ridge's memoir, Flash, names one of Publishers Weekly's Best Summer Books of 2015, kids will fall in love with this endearing donkey as they learn to appreciate the value of true friendship." This book was both harder (and more fun) than I could have imagined. As a mural artist, I went into it thinking, "Pfff, how hard can it be to create 9x10 inch pages?" I drew and re-drew. I painted and repainted. I Photoshopped and re-Photoshopped. I obsessed. Fretted. Gave myself hip bursitis from sitting in my chair for weeks on end. And of course, I fell in love with my characters. Between now and October 1, I'll introduce you to the characters and tell you why I chose them! 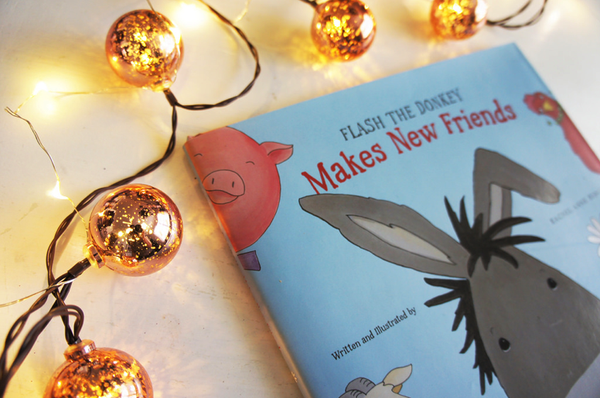 You can pre-order Flash the Donkey Makes New Friends on Amazon – and I'll be honest, I'll love it if you do! Buy it for your kids, grandkids, students, and friends. You can even buy it for yourself, just because you know Flash personally and should probably have one of your own! Here's a link to a bit more about the book. Flash the Donkey Makes New Friends. God uses ordinary events to reveal His extraordinary purposes. Just when you think you're going in circles in your everyday life, He can intercept your plans and make His ways known to you. There's a story told in the Bible–1 Samuel 9–of a young man who is engaged in ordinary family affairs. His father's donkeys have gone missing, and he is given the task (along with a helper) to go and find them. The young man's name was Saul...and he had no idea that his search for a band of renegade donkeys would start a chain of events that would eventually make him king of Israel. The mission takes the pair of young men on a frustrating journey all over the countryside. I'm sure they were thinking, "where on earth could these pranksters be?" They would have been familiar with the inquisitive nature of the animals, and probably realized just how much ground the sure-footed creatures could cover. After three days of looking high and low, they finally give up and decide to head back home. Without cell phones to use to check in, Saul knows his father will be worried. In one last-ditch effort to find the donkeys they seek out the prophet Samuel, who just so happens to be in the area, in order for him to inquire of the Lord of the their whereabouts. Unbeknownst to Saul, God had spoken to this prophet the day before, preparing him for their encounter. He told Samuel exactly what would happen and how the young man would come looking for him, and that this tall teenager was the one He'd chosen to be king. The scene unfolds just as God described it. Samuel invites Saul to feast with him and then just before they part ways, he anoints Saul's head with oil. This sacred action marks Saul for God's purpose in a tangible way. Saul, however, is still concerned about his father's donkeys, to which Samuel reassures him. "Those donkeys? Pssh, don't worry about them. They've already made it safely home on their own." The donkeys didn't even really need to be found. Because God had had something else in mind. You see, the real purpose of Saul's journey was not to find a group of runaway animals. It was to get him to a place of encounter with God. The task he was doing for his father was simply a means to move him into the right place at the right time. It was when he was out of his comfort zone, his familiar surroundings, that God brought him face to face with what would be his true mission in life. He was anointed for kingship right then and there. I wonder if you, too, are on a seemingly insignificant journey? Maybe your job is one that feels like it is going nowhere. You're wandering in circles, looking for your purpose, and yet somehow you know this is where God wants you. It all seems like such a waste of time and you're tempted to give up. Perhaps God is moving you to place of encounter. Perhaps, like Saul, God is leading you to moment of divine appointment. A place where your vision and purpose will suddenly come into full view! Watch and see: His purpose WILL unfold. People and events will cross your path through divine appointments as you journey onward....things that would never happen unless you just keep going. Keep taking that next step. God uses ordinary events in extraordinary ways. He is able to take a "seemingly insignificant" job and boom! use it to put you right where you need to be. Proverbs 16:9 tells us that a person can think he's planned his ways, but God is working behind the scenes to direct each step. Tell me: have you ever encountered God's purpose in the midst of the regular affairs of your life? Have you ever said, "so THIS is why I've been on this journey!" ? I'd love to hear about it. Do you feel like you're going in circles today, trying to follow God's leading but can't figure out what His purpose is? Let me pray for you, that you'd encounter Him in a way that will clearly show His care and design for you. God still uses ordinary donkeys. Just ask Flash.